In the previous post I described the glitch I encountered using the Block RAM in the Zybo in Dual port mode. 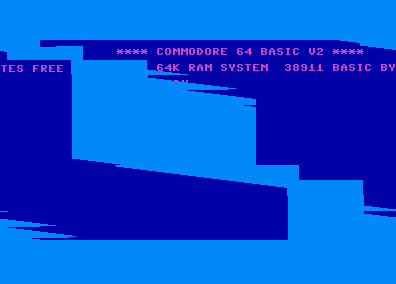 With this glitch the VIC-II couldn't read the contents of RAM from the assigned Block RAM port. In the end the issue seemed to be related to the fact that the VIC-II only uses the first 16KB of memory. We solved this issue by first reading the full range of RAM a couple of times from the assigned VIC-II RAM port upon startup. 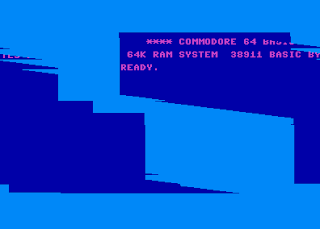 In this post we will be implementing functionality so that the frame data produced by the VIC-II can be written to SDRAM which we will in turn download on a PC so we can verify that the frames produced by the VIC-II on the physical FPGA are indeed correct. You might recall that in a previous post we developed a Verilog module called burst_block with which we managed to write data from the FPGA to SDRAM. In this post we will also use this module to capture video data from our VIC-II module to SDRAM. There is, however, a couple of modifications we need to do to our design before using burst_block for this purpose. The first required change is due to different clock domains. The burst_block uses the AXI clock which runs at 100MHZ, which we cannot really change. Our VIC-II core, however, outputs pixels at a rate of 8MHz. We therefore need to put in some effort to accommodate these different clock domains in order to avoid setup and Hold violations. The second required change is due to different data widths. Each pixel output of the VIC-II has a data width of 24 bits whereas the burst_block expects data words of 32 bits. This is a waste of 8 bits per pixel! We can definitely improve on the differing data width situation. Firstly, 24 bits per pixel from the VIC-II might be a bit of a overkill considering that the VIC-II only have 16 distinct colors. We can truncate each pixel from the VIC-II to 16-bits using the RGB565 format. With the RGB565 format we have 5 bits for Red, 6 bits for Green and another 5 bits for Blue. With the pixel output of the VIC-II truncated to 16 bits we can fit two pixels within the 32-bit word input to the burst_block. Let us start with the requirement of squeezing two pixels into a word that goes to our burst_block. The clock source should be the same as the one that drives the pixel clock of the VIC-II, which is 8MHz. Obviously the write to burst_block should only be triggered every second clock cycle. As mentioned earlier, our burst_block is clocking at 100MHz and the VIC-II clocking at 8MHz, which is two cross clock domains which needs special attention. The key port to look at is write. When the axi clock transitions to a high and write is a 1, then the contents of write_data will be written to an internal buffer of burst_block, queued for writing to SDRAM. Ideally we should try to keep the write wire high for one axi clock pulse somewhere in the middle of a clock pulse of the VIC-II pixel clock. Let us start by first determining the centre of VIC-II clock pulse in terms of 100MHz clock cycles. We can fit 100/8=12.5 100MHz clock cycles on a single VIC-II clock cycle. The length of a single VIC-II clock pulse, is half of this, eg. 6.25 100Mhz clock pulses. The centre of a VIC-II clock pulse is therefore 3 100MHz clock pulses. target_logic_level keeps track of the current logic level the 8MHZ clock signal we expect. When we encounter 3 consecutive clock cycles of this logic level, we know we are more or less in the centre of the clock pulse. pixel_sample_offset ensures that we only trigger a write every second pixel as mentioned earlier. blank_signal also plays an important role since we don't write pixels during horizontal and vertical blanking. Currently in the current state of the burst_block you can only send it data and we have no control over the address used to write the given data to. This poses a problem when we want to write a new frame where we want to set the address back to beginning of the frame buffer. Previously axi_start_address was only set to a initial value on a reset. We have extend the if statement to also set the address when next_frame is set and count_in_buf is zero. Why should count_in_buf be zero? Well, the moment we hit a next_frame, we might still have a partially filled buffer. Before we reset the address we should ensure that this buffer is flushed, otherwise the last bits of data of the frame would appear in the beginning of the next frame. Previosly we only initited a AXI write transaction if the buffer reached a certain threshold. We have now added an extra condition to also start an AXI write transaction if we are at the end of the frame and we still have some data left in the buffer. You might have realised that I am appending two zeros to values that is assigned to addresses and lengths. The reason for this is because our buffer works in terms of 32-bit words, whereas the AXI bus expects values in terms of bytes. With all the modules hooked up, the Design Synthesised and Bitstream written, let us have a look at some results. We will again do the programming of the FPGA within Xilinx SDK and fire off a hello world program in Debug mode as we did in a previous post where we originally developed burst_block. This will dump a portion from the Zybo's SDRAM to your PC/Laptop as a binary file. The start address is 0x200000, which is the start address of the framebuffer mentioned in the previous section. The number 57368 is amount of data to transfer in terms of words. In this post we are using a word size of 32 bits, so let us do some quick calculations. Our frame is 404 pixels wide and 284 lines high, giving a total of 114736 pixels. Within each word we can accommodate two pixels, as mentioned earlier. So, we need to divide 114736 by two, giving us 57368, which is the number we should supply our mrd command as a parameter. I captured a couple of frames with this command and used a custom program for converting these binary files to a format that an image viewer can open. The frames faintly resembles the C64 Welcome screen, although distorted. The distortion still requires a bit of investigation and I will report back in the next post. In this post we have implemented the functionality for writing the frame output of our VIC-II module to SDRAM. Checking out the frames produced by running the design on the FPGA itself faintly resembles the C64 Welcome screen with some distortion. In the next post I will report back on whether I could isolate the cause of this distortion.